Neyland Stadium is one of Tennessee’s landmarks. After 16 expansions already it grew from a capacity of just 3,200 to 102,455. The most expensive change to date came in 2005-2010, when the north and west sides benefitted the most, now decorated with new brick facades. That revamp was carried out in three phases and it’s also what’s planned now, in the latest planned upgrade. For the last 9 months Populous and MHM have been studying potential changes that may be done to the stadium in order to improve the quality of available facilities, as well as boosting revenue. Their study will bring first results in August of 2019, when phase one is expected for delivery. These changes would include improved crowd flow and access, additional railings for fans, but the true quality leap considers corporate facilities. A brand new endzone business club is planned, forcing removal of the first couple rows of seating. It will provide a vast lounge inside the stadium and access onto a portion of the field. Additional corporate club is planned in the west stand’s lowermost part, providing premium quality seating as well as a covered space for events and pastime when game is not played. Further changes during the first phase include new away team locker room, as well as expanded ground-level concourses for fans. University of Tennessee has already earmarked $ 106 million for phase one alone, while two other stages are expected to follow. 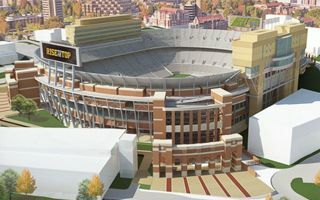 During phase two Neyland Stadium would receive two massive entrance gates on the south side (south-west and south-east), improvement of facilities on ground level (this time east and north sides of the stadium), 15 skyboxes for 12 people each (south end) and many more upgraded facilities for the university’s athletics department. Phase three will see all remaining concourses improved up to the very top of the stadium, as well as numerous technological improvements: new videoboards, sound system, WIFI, etc. While there’s still no detailed timeline for two final phases, it’s understood all of the above-mentioned changes will mean a decrease in capacity. It won’t be significant though, because the stadium is still expected to remain above the 100,000-point. Will it remain in the world’s top 10? For details on that we still have to wait.